She got up to go outside to learn more, but when she tried the front door, it wouldn’t budge. Her house had shifted. She was stunned to discover a cluster of sinkholes had surrounded her home Feb. 15. Morrill was forced to leave her home in the huge retirement community 50 miles northwest of Orlando, where pockets of sinkholes have emerged the past couple of months. “It’s horrid,” Morrill said at a recent Q&A session hosted by The Villages government, which more than 200 residents attended to learn more about the area’s risk for sinkholes. Two of the four families forced to evacuate after holes as large as 35 feet deep and 18 feet wide appeared have been able to return to their homes. More than 400 such pits have been reported in North and Central Florida since Hurricane Irma because of extreme weather, said Anthony Randazzo, a professor emeritus of geological sciences at University of Florida and president of Geohazards Inc. in Gainesville. 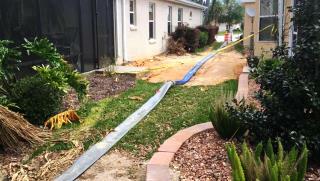 More are likely to occur as the state’s unofficial “sinkhole season” ramps up while Florida receives more rainy weather. The Villages, which has historically reported high numbers of sinkholes because of the soft soil where thousands of homes have sprouted, has always been a problem in the Sunshine State — unbeknownst to many retirees who settle there. Seven sinkholes showed up in and around Doris Morrill's home at the Village of Calumet Grove since she was first stirred awake Feb. 15, 2018. Morrill has not been able to return to her home. Steve Mowers, 72, who lives across from Morrill and moved from upstate New York with his wife, Mary Ann, said real-estate agents made no mention of the possibility of sinkholes when they moved to the retiree haven. “That’s close to $1 million worth of property you’re looking at,” Mowers said, nodding his head toward Morrill and her neighbor’s home, where a sinkhole had formed between them. Officials still are not sure what caused the depressions, leaving many residents unsure of the future and others worrying about the prospect of more. “Until this happened, I didn’t want to go back North,” Mary Ann Mowers said. Insurance companies have not finished their evaluations, said Don Deakin, an elected supervisor for one of The Village’s community districts. But he said the cause does not appear to be from the stormwater pipe that many residents have named as the prime suspect. Still, life tried to continue as usual for many in the retirement community. On a recent morning, golfers at the nearby Lopez Legacy Golf & Country Club worked around both sandpits and sinkholes. Golf carts veered around the filled-in pits. But the holes continue to grow. “They filled up Doris’ front entrance [with dirt and concrete], and of course that’s down again, and the crack in the house has gotten bigger,” Mary Ann Mowers said. Since Irma swept through the region Sept. 11, the craters have formed at Cane Garden Country Club and the Villages of Santiago and Glenbrook, where another 30-foot-wide cavern appeared last month. But none of them, Randazzo said, are as bad as the 1981 sinkhole in Winter Park that nearly swallowed an entire block, topping out at 350 wide and 75 feet deep after it devoured Porsches and a German auto dealership. Across the street from Morrill, another hole had formed and was filled 10 days earlier after Mowers notified officials. The Villages government will have another Q&A session from 7 to 9 p.m. Thursday at Mulberry Grove Recreation Center.